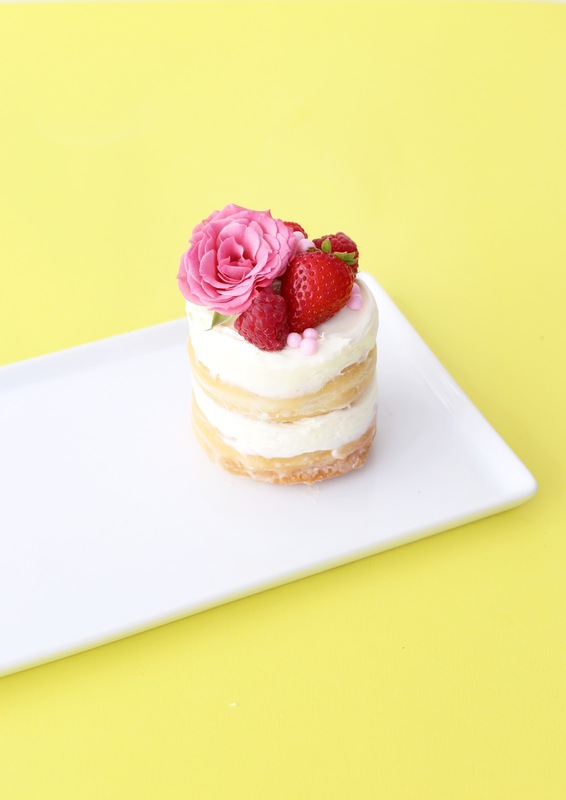 5-Minute No-Bake Naked Cakes! / Hey, EEP! For this week's episode of Hey, EEP Weddings I'm sharing my "recipe" for No-Bake Naked Cakes. You're going to freak when you realize how easy these are to make. Ready? Layer frosting and glazed donuts (that's the secret ingredient!) and top with pretty decorations. Did I lose anyone? Everyone keeps telling me NOT to make my own wedding cake. Well, I think this easy naked cake DIY proves them wrong. This is the perfect edible project for a casual reception, bridal shower, bachelorette party—heck!—even a birthday celebration or a rando girl's night. You'll want these to look a little rustic without going overboard. To keep the frosting at that perfect carefree-neatness level, use a resealable plastic bag to "pipe" frosting between donut layers. For decoration, I used food-safe roses, berries and little pink "bubbles." Per usual, tweak that to fit the color palette and/or party you're going for. This would even be a fun project for a kid's birthday party, where you can set out different types of candy, cereal and sprinkles for toppings. 1. Put 1 donut on a plate. Put vanilla frosting in a resealable plastic bag, squeeze into one corner, snip the tip and pipe onto the donut, leaving about 1/4 inch border around the edges. Top with another donut; press down gently so frosting squeeze out from the sides. 2. Pipe frosting on top of the donut stack. Use an offset spatula to smooth the edges and top of the cake. 3. Snip 1 rose about 1-inch from the flower base; press into the cake. Add 1 strawberries, 2 to 3 raspberries and pink sprinkles. Repeat to make as many cakes as desired! NOTE: You can use whatever type of donut you'd like for this project. I don't recommend eating the rose.